Alain Mabanckou (b. 1966) visited the University of Oklahoma in April 2016 as the twenty-eighth fellow of the Puterbaugh Festivals of International Literature & Culture, which have featured many of the world’s most celebrated writers (including seven Nobel Prize winners). Highlights of the week included a bilingual reading of Mabanckou’s poetry, lectures by visiting scholars Lydie Moudileno and Dominic Thomas, a roundtable discussion of francophone literature and culture, and Mabanckou’s keynote, “‘The Song of a Migrating Bird’: For a World Literature in French,” which can be read on the WLT website. A prolific francophone poet and novelist, Mabanckou has been called “the African Samuel Beckett” and “a novelist of exuberant originality” for his wordplay, philosophical bent, and sometimes sly and often absurd sense of humor. A French citizen born in the Republic of the Congo, Mabanckou currently lives in LA, where he teaches literature at UCLA. The author of six volumes of poetry and twelve novels, he is the winner of the Grand Prix de la Littérature 2012 and has received the Sub-Saharan African Literature Prize and the Prix Renaudot. 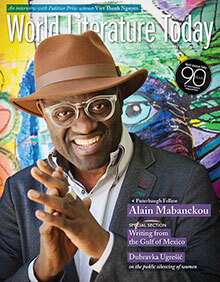 In 2015 Mabanckou was a finalist for the Man Booker International Prize. His books in English include Blue White Red, African Psycho, Broken Glass, Black Bazaar, Tomorrow I Will Be Twenty, Letter to Jimmy, and The Lights of Pointe-Noire. To read more about the Puterbaugh tradition, visit puterbaughfestival.org.